In 1999, Rev. Larry E. Campbell received a certified letter from Rev. 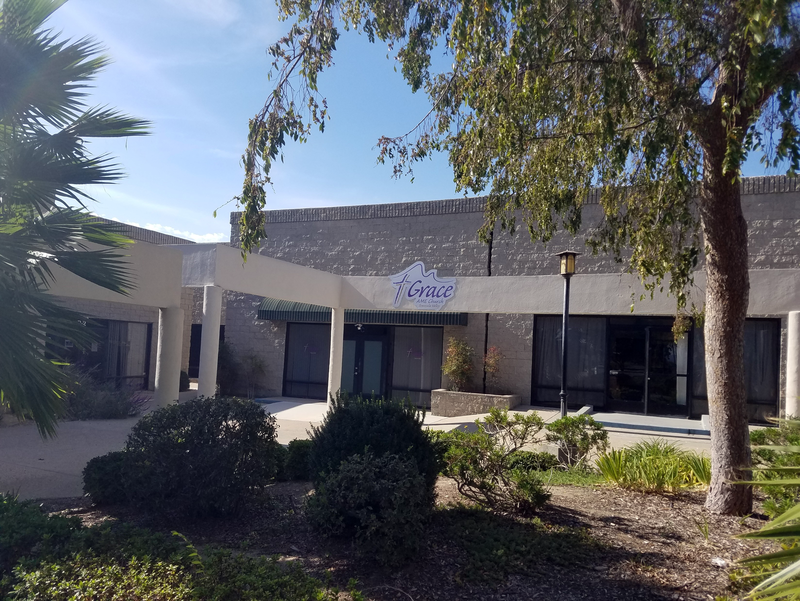 Dr. Howard S. Gloyd, Presiding Elder (Los Angeles - San Diego - Las Vegas District) to pursue the development of a new congregation in the rapidly growing city of Temecula. In support of this effort, Rev. Mark K. Tyler and the members of Prince Chapel by The Sea A.M.E. church of La Jolla, agreed and committed to becoming the sponsors of the "Temecula Mission." Additionally, Rev. Jordan Davis, Pastor at Bethel A.M.E. church of Perris, also joined in this effort by asking volunteers from their congregation to assist in making the Temecula Mission a reality. The first prayer service and constitution meeting was held on December 28, 1999 in the recreation room of the Sycamore Terrace Apartment complex with nine members standing. The new church was named Grace Chapel African Methodist Episcopal Church, and Grace Chapel expanded under His leadership. They celebrated their first worship service on Sunday February 13, 2000 at 10:30 am. Rev. Campbell continued to service as an active member of the United States Marine Corp. In March 2004, Rev. Campbell received orders to Okinawa, Japan for a year. During this time, Rev. Tracey Johnson was assigned to serve as the supply Pastor of Grace until Rev. Campbell returned. Rev. Campbell and his family continued serving faithfully during this time. In June 2006, through God's divine direction Bishop John R. Bryant transferred Rev. Campbell to St. Paul A.M.E. church in San Bernardino, CA as the Senior Pastor for several years before being reassigned by Bishop Larry T. Kirkland to First A.M.E. Pasadena, CA as the Senior Pastor. In June 2006, through God's divine direction Bishop Bryant assigned Rev. Jonathan C. Maxey as the Senior Pastor of Grace. Under Rev. Maxey's leadership, the name was officially changed from Grace Chapel African Methodist Episcopal Church to Grace of Temecula Valley African Methodist Episcopal Church. Rev. Maxey served faithfully at Grace expanding and creating several new ministries. The Nettie May Julian Women Missional Society (WMS) was formed. A media ministry was launched to provide recordings of Church Services to members including those who were "sick and shut in." Reverend Maxey developed a great working relationship with community leaders in the Temecula Valley resulting in Grace growing its food ministry through the Angel Food program, providing a shelter for the homeless and Grace designated as a drop center for the Marines “Toys for Tots” program. A youth ministry was also launched with a contemporary dance component that lead to growth in young adult church attendance. October 2011, saw another pastoral change through God's divine direction, Bishop Kirkland appointed Rev. Stephen Atkins as the new Senior Pastor at Grace of Temecula Valley African Methodist Episcopal Church. During Rev. Atkins tenure, The Children’s Church program was enhanced and made a part of regular church services. The children were given the opportunity to actively participate in the service and demonstrate what they learned from the ministerial staff. Rev. Atkins led a very active weekly Bible Study providing in depth study of God’s word. He faithfully participated in all church ministries with diligence that modeled his commitment to God and the congregation serving for two years. On October 13, 2013, Bishop Kirkland, through God's divine direction, appointed Rev. Antonio F. Dupré Sr, as the new Senior Pastor to Grace of Temecula Valley African Methodist Episcopal Church. Since Rev. Dupré's appointment, he has reorganized the Church and re-incorporated Grace, and officially changed the name to Grace African Methodist Episcopal Church of Temecula Valley. Rev. Dupré is actively involved with and connects with the sick and shut in through regular calls and visits. Rev. Dupré reorganized the worship service and it continues to be spirited and edifying. Rev. Dupré imparts the word of God through praise, worship and the preached word. The church designated the second Sunday as Youth Sunday in which the youth lead the congregation through many aspects of church service thereby growing spiritually, building confidence, public speaking, social and communication skills so they can be future leaders and productive missionaries.